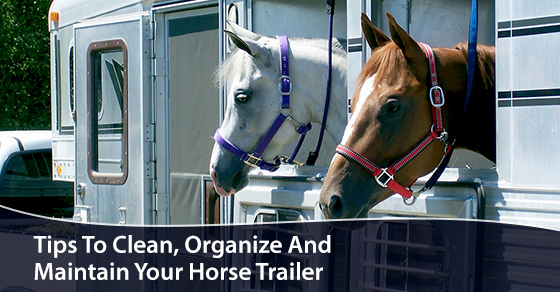 Everyone who works with horses knows the feeling of dismay when you look into a horse trailer. There are often dirty compartments, messy tack rooms, filthy floors, and general maintenance issues. Many people ignore the issues and just think, “I’ll deal with it later.” But your investment will be better protected if you keep your trailer clean, especially if you’re paying off truck loans. A clean trailer will also be better for the comfort of your horses, along with your general peace of mind. To keep the mess in the trailer from becoming overwhelming, use these trailer cleaning tips to help you break your trailer maintenance down into bite-sized pieces. Take the mats out of the trailer and wash the whole of the area the horses were in. Use pressure-washing technology on the floor and spread baking soda across it before you put the mats back in. This reduces damage and makes the place smell fresher. You should also get a trailer waxed every 3 months or so to preserve your its finish. Most show tack can stay in the trailer. You should have a system for hanging it up. Make sure that all of your bridles have been hung correctly, and that the show saddles are cleanly resting in their proper bags. But take the work tack out of the trailer and vacuum the floor of the tack room. If everything has its own spot within the trailer, you’ll have a much easier time unloading and loading because of your efficient organization. When horses travel, it’s possible for them to become exposed to diseases. After you use the trailer, you should disinfect it with bleach to keep germs from continuing to spread. You might need to cut a hay bag, lead rope, or halter during an emergency. Make sure each important area of the trailer is equipped with its own pair of tough scissors. When horses are travelling, they’ll often get crampy and stressed. You’ll want to have meds within easy reach. It’s helpful to load the horses based on their personalities. More anxious horses should be put next to calm horses. Make sure that you place horses that get along well near each other. This helps make for a more comfortable and safe ride. If you’re travelling over long distances, you can easily swap the full bags out with the empty ones when you stop. It saves you from needing to buy extra hay. Instead of loading all the saddles, then the bridles, etc., load your items by horse. This way, you can make sure every horse has everything they need. After that, you can load the grain and hay, and finally load the horses. You can keep a list on your cell phone and check things off as they’re packed. It will help keep you from forgetting things, and it smooths the overall hauling process. If you dilute Dawn dishwashing liquid in a bucket of water, you can use it to clean both the inside and outside of the trailer walls. Dawn is gentle enough to avoid scratching the paint and any decals that your trailer has. If you have a particularly big trailer, it helps to bring it to a truck wash. A truck washing service will make your aluminum shine and restore your trailer to almost brand-new. You’ll find inexpensive Mr. Clean sponges, chrome-wheel polishing kits, Armor-All that lets you shine vinyl and rubber, and other goodies. Blown tires can cause huge damage to your wheel well. Make sure you monitor the tire pressure, check your tires for wear, and rotate them as suggested in your owner’s manual. These doors aren’t supposed to be open while you’re driving. Keep them shut to stop your horses from having potential panic attacks. Horses will sometimes get into disagreements with each other. You should let a mat hang down between the stalls, or use another type of lining to keep the horses from leaping into each other’s stalls. The pellets will absorb the urine of the horses and expand into normal sawdust. Just a few bags will fill the trailer. Trailers often have limited storage, so it’s helpful to buy a trailer with one more stall than the number of horses you plan to transport. Put your little pieces in first, followed by your big pieces. That way, when you unload, you can take the big pieces out first without any hassle. This is the best way to make sure you know where everything is. When you do this, you’ll keep the rest of the trailer’s space from becoming dirty as well. Try using a plastic trash can for soiled items. One box can hold a lot of items, including horse blankets, buckets, and bulky equipment. The more hooks you have, the more tack you can hang. Use your storage space effectively by sorting your items into their proper areas. Shelves add to your storage space and can be used to hold boots, hats, and other small objects. For more information about truck loans, call Truck Loan Center at 1-866-230-0094 or contact us here.